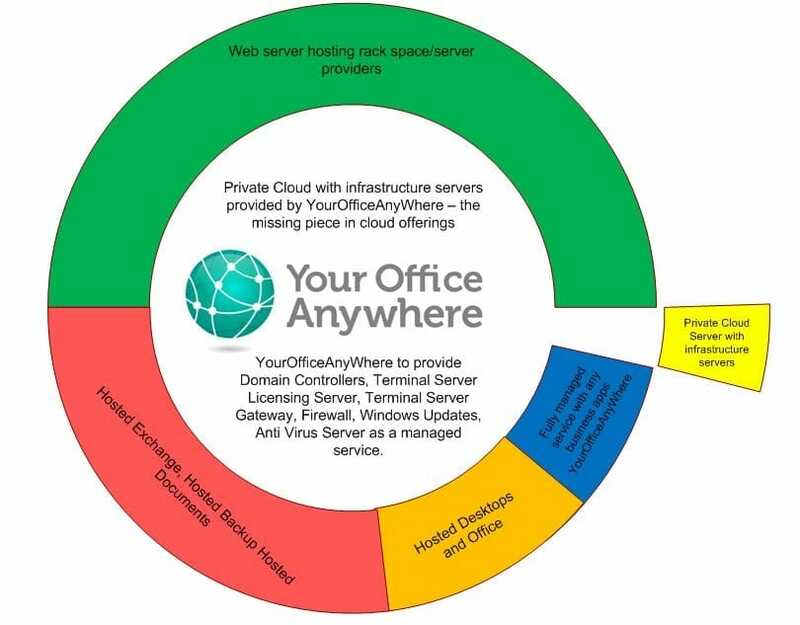 YourOfficeAnyWhere are to offer a Private Cloud Managed Service that sits somewhere between the fully managed cloud service that we already offer and the offerings lots of providers have around a server with memory and processor but little else in terms of licenses, antivirus, windows updates, failover to other hardware and backups. Below is a Q & A session about the Private Cloud Managed Service with Director Michael Carter. Q. Why are you creating this solution? A. We see this (Private Cloud Managed Service) as a gap in the market. There are a few hosting providers who will provide a customer with a managed service to host specific applications such as office and email, and there are even fewer providers like YourOfficeAnyWhere who will work with a customer to get their line of business application working in the cloud. Below this currently are the numerous rack/server providers who will provide a server with memory/disk space and a windows server license, but this falls short of providing user authentication to a windows system, a terminal server licensing server to manage remote desktop connections, antivirus, Microsoft licenses…… the list goes on. A. We provide a Dell Server with 96GB memory, 8 processor cores and unlimited Windows Server guests or 50% of this – 48GB memory but still with 8 processor cores. We need to standardise on a solution and this type of server configuration fits the bill, however if a customer has different requirements we are more than happy to discuss this with them. The key to this is that the physical server will only host their servers so they are in complete control of their processor and memory allocation to servers that are “guests” of the physical hardware. Q. So how is this different from all the other cloud server providers? Supply credentials to logon to a windows domain (active directory servers) based on your company name and declare the licenses to Microsoft to ensure you are compliant. Provide a terminal server licensing server for remote desktop licenses and declare the licenses monthly to Microsoft. Without a terminal server licensing server you cannot run a remote desktop solution. We can also provide any Microsoft license on a monthly rental basis including SQL server CAL’s, Microsoft Office CAL’s, Visio CAL’s and Microsoft Project CAL’s etc. Pretty much any license Microsoft currently supply on the open market we can rent legally on a month by month basis. We provide a Terminal Server licensing server as part of the solution so you can ensure you can connect to your remote desktops. Effectively we are providing all the background infrastructure servers you would require to allow users to remotely connect to a server without having to build and configure these on the server you purchase from another provider. If you have any other licenses required to run your business this just needs to be installed on the Private Cloud Managed Service and activated. Q. Why shouldn’t I just have a fully managed service? A. Well you can – the benefit of this solution that will suit “some” customers are that we are giving an element of control back to the end customer. On our managed service a customer cannot stop and restart a server this has to be requested by the customer so we can track this. The memory allocation of customer servers (guests) are managed by YourOfficeAnyWhere because if a customer adds more memory to their server it could affect other guests on the host. If we are providing a physical server which has all of a customer’s guests on it they can provision it how they see fit i.e. processor and memory allocation to each guest on the host. An example scenario is where a payroll server needs 8GB of memory to process the payroll at month end but doesn’t need anything like that during the rest of the month the memory and processor resource for that server can be increased and decreased as required each month by the end customer. YourOfficeAnyWhere will still ensure that antivirus software is up to date and ensure that the guest servers are patched with Windows Update software patches. Q. OK so what infrastructure servers would I need if I didn’t get a solution from YourOfficeAnyWhere but went to a provider who was giving me just a server, disk memory and a Windows Server license in the “cloud” and what do these servers provide in layman’s terms that I would have to build and provide myself? Terminal Server Gateway x 2 for resilience. Provides access once authenticated to remote desktops. Another physical server. If the host server fails you would want this to fail to another physical host without any (or little) downtime. This requires significant infrastructure in terms of network storage from a tier1 provider such as EMC and resilience physically built into the infrastructure at the network, switch, and power. We will also ensure software compliance and declare all the required Windows licenses you need on a month by month basis. A. Yes if anyone has any specific questions that will improve the quality of this blog post please feel free to ask below and we will answer these questions. Why not also visit our private cloud page that tells you more about the service we have on offer. < Windows 2008 Remote App Hangs. Is It Waiting for a Dialog Box?